One young Zionsville citizen gained a new perspective on his city last month. 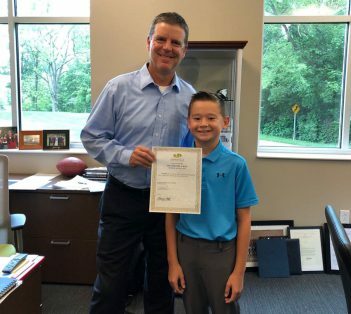 Beckett Suh, an incoming fifth-grader at Zionsville West Middle School, spent June 27 as Mayor of Zionsville for the day. The opportunity arose at the Zionsville Education Foundation’s Barn Bash Fundraiser, where families could bid on a “Mayor for the Day” auction item. According to Suh’s mother, Andrea Suh, bidding seemed like an obvious choice because Beckett had already expressed curiosity about what the Mayor of Zionsville did on the job. While serving as mayor, Beckett spent time with Zionsville mayor Tim Haak. Beckett said he was surprised by how much time he got to spend traveling around Zionsville with Haak. “I thought it would be all meetings, but a lot of the time we got to drive around and check on things. I saw new neighborhoods and parks that were developing,” Beckett said. For Beckett, the highlight of the day was a visit to the local police station, where he learned how officers collect evidence, and a trip to the local fire station. “I got to lift the ladder up to the max height and spray water from the ladder,” Beckett said. Andrea said Beckett’s experience exceeded her family’s expectations.